Here’s a roundup of our favorite yoga mats to use if you have bad knees. Injured or hypersensitive knees can make doing yoga on an ordinary mat painful. Fortunately, a little extra padding can go a long way towards achieving a pain-free yoga session. The best yoga mat for bad knees is non-slip, high-density, and plush enough to prevent your knees from getting banged up during your favorite poses. Many of us enjoy the system of breathing techniques, physical postures, and meditation derived from the ancient practice, but not all of us are equipped to deal with the pain and discomfort associated with a second-rate yoga mat. That extra cushion between your body and the floor means less pressure on the joints and bones as you power through poses. In addition, a mat that is too thin can slide and fold over easily, causing a falling hazard. A thicker mat can also help you avoid further injury by keeping a barrier between your body and the cold floor. Your muscles are kept warmer making them less prone to injury. Now that we’ve covered what makes a great yoga mat for individuals suffering from bad knees, let’s see the key features you should look for. Premium Thickness: Yoga mats vary in thickness, ranging from 1/16-inch thick for travel mats to as thick as 1/4 inch. The minimum thickness you want to choose is a standard 1/8-inch-thick mat. Cushioned Material: The material of the yoga mat can make a significant difference in its texture, stickiness, and sponginess. Most yoga mats are constructed of PVC, or vinyl, which has the most “give” of any yoga mat material. Smooth Texture: Some yoga mats are manufactured with a bumpy pattern or roughness that can further irritate the knees. Opt for a mat that has a smooth texture and a softer feel. 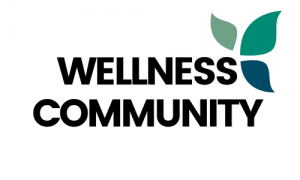 Sufficient Stickiness: While too much stickiness can be uncomfortable on the skin, some stickiness is needed to prevent the mat from slipping during poses. PVC mats have a suitable amount of stickiness. Here are the best yoga mats for bad knees based on quality and user experience. Need a new yoga mat for your yoga, Pilates, stretching, or toning workouts? 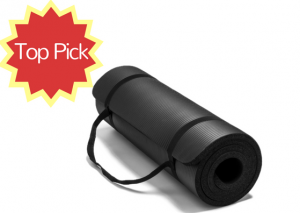 Consider the Spoga Premium Yoga Mat. Available in a selection of vibrant colors, the ultra-thick mat features exclusive Spoga comfort foam technology which provides users with incredible impact absorption. The mat measures 71-inches by 24-inches and has a non-slip texture to prevent slippage and injuries. The low-priced, high-performance mat is perfect for home or travel. It rolls up tightly and comes with carrying straps for lightweight portability. The moisture-resistant material is easy to wipe down and keep clean. Relieve the stress off your knees with a super thick yoga mat. 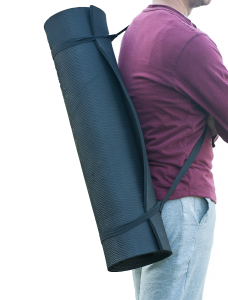 The Matymats Non-Slip TPE Yoga Mat is the perfect sports accessory for individuals who engage in basic yoga, hot yoga, Pilates, gymnastics, Bikram, meditation, and other popular practices. The 72-inch by 24-inch eco-safe, non-toxic mat is a whopping ¼-inch thick. The high-density thickness helps to cushion the knees for long-lasting comfort. The best yoga mat for bad knees is also composed of modern materials. The Matymats yoga mat is constructed of a thermal plastic elastomer (TPE) material. This newly developed material is 100 percent PVC-free, hypoallergenic, and contains no rubber, latex, or rubber. There is also no unpleasant smell like with many other yoga mats. While it has a premium thickness, the mat is still lightweight. 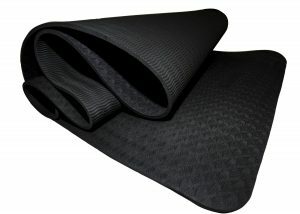 The top-quality mat features a high-elasticity and has double layers in a unique textured design for optimal style. Bring the yoga mat with you while you travel, as it easily rolls up and can be tied with an adjustable carrying rope. If you take your yoga fitness seriously, the Sivan Health and Fitness Yoga Set 6-Piece is definitely something you want in your exercise arsenal. The 6- piece set includes one 1/2-inch-thick NBR exercise mat, two yoga blocks, one yoga mat towel, one yoga hand towel, and one yoga strap. The real star of the collection is the ultra-thick yoga mat designed exclusively with memory foam for ultimate comfort. The mat features a ribbed surface on one side and a smooth surface on the other. The best yoga mat for bad knees is also slip-resistant. This mat has a non-slip surface that helps to grip the floor to prevent injury. The 71-inch by 24-inch yoga mat is a great aid when doing Pilates, stretching and toning workouts, and of course yoga. The yoga blocks included provide additional support and balance to allow for a greater extension of the body. You can deepen your stretch even more with help from the 6.5-foot yoga strap. Worth so much more than it costs! Not all yoga mats are designed the same, so it’s important to your research before choosing one. What makes the My Eco Yoga Mat different than its competitors is its environmentally-friendly features. Made from TPE, the non-toxic mat is both hypoallergenic and free of latex, rubbers, metals, and PVC additives. At 5/16-inch thick, the mat provides sufficient cushioning for your knees, back, and joints when practicing yoga on hard floors. The mat measures 74-inches by 30-inches and is one of the widest eco-friendly mats currently on the market. It’s also easy to transport, store, and clean, and is constructed out of a durable, long-lasting material. 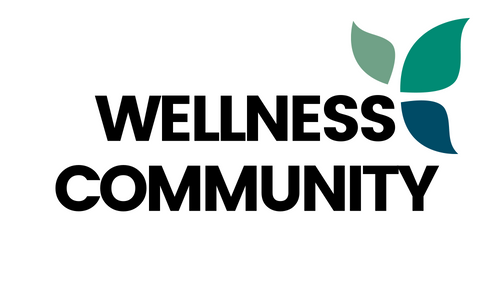 Your health and safety are of the utmost importance. The Yoga Mat by DynActive helps you maintain your wellbeing by delivering comfort features that are excellent for individuals suffering from bad knees. The best yoga mat for bad knees is one that offers a thicker, denser core without sacrificing a quality construction. The TPE material performs better than its competitors and the unique factory tested grip provides the highest traction available. 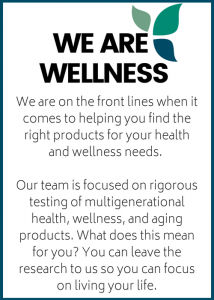 The non-toxic, latex-free mat also features a closed-cell structure that helps to lock out germs, dirt, and moisture. The mat’s lightweight material is also perfect for home or travel. It can be hard to find a yoga mat that offers the perfect balance of cushion, durability, grip, and style. The Yoga Mat by DynActive delivers all of these aspects and more. 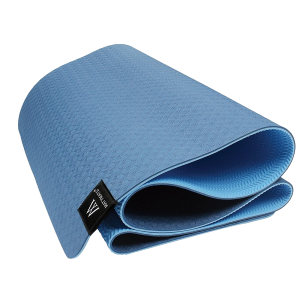 Best of all, you can customize your order by choosing a high-density memory foam yoga mat in a selection of colors.